Sea to Summit Ether Light XT Insulated Sleeping Mat. 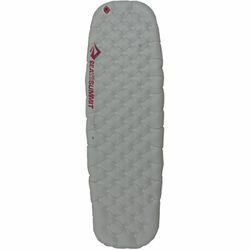 The new Women’s Ether Light XT Insulated Air Sleeping Mat offers a high degree of comfort at a low weight. Additional Thermolite® insulation (compared to the unisex model) provides three-season warmth for women backpackers. IS THIS WOMEN'S INSULATED AIR SLEEPING MAT…? Suitable for backpacking? Yes. The Regular size weighs only14.8 ozs / 420 g, and packs down to 4.5” x 9.5” / 11.5 x 24cm) – ideal for backpacking, bike touring and camping. Warm enough for four-season use? Close. This air sleeping mat has a tested R-Value of 4.2 which is enough insulation for sleeping from early Spring to Late Fall. Comfort & Support - 4 inches thick offers unrivaled comfort and support and you won't feel the uneven ground beneath you. Women's Specific Sleeping Mat Shape - Narrower in the shoulders, wider between the hips and knees. Offers greater comfort and you won't feel the uneven ground beneath you. Perfectly shaped to match Sea to Summit's Women's Sleeping Bags. Quick and easy inflation, deflation and adjustment made possible by our patent-pending multi-function valve and supplied Airstream Pump™/stuff sack.